We invite you to join us to a 3-day weekend festival in Tainan, the original capital of Taiwan. With more than 50 artists performing at 6 different venues around the city, come experience the magical city of Tainan. LUCfest is dedicated to bring international musicians to the stage; from independent and upcoming to internationally renowned artists, the range of performances is unlike any festival in Taiwan. Throughout the weekend we will also be hosting a series of musical forums that will be discussing topics such as “the Asian music community” and “International touring”. Lucfest is a showcase festival which combines music conference that gained foothold in Taiwan and aims to connect with Asia to take further the global music industry. 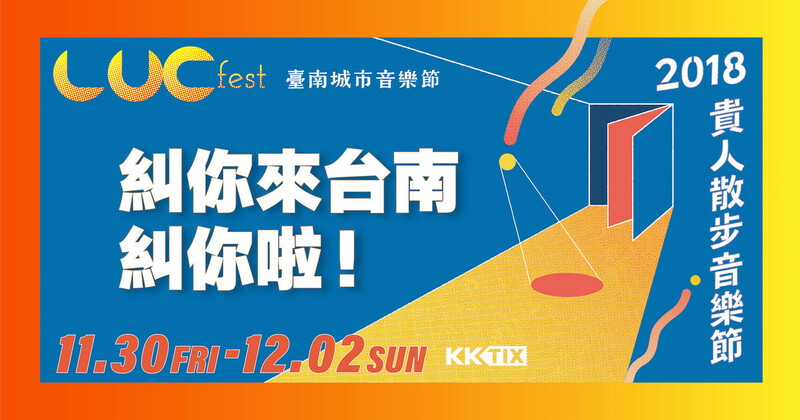 From 11/30/2018(Fri) to 12/2/2018 (Sun),LUCfest will present a 3 days event in Tainan. More than 10 showcase performances will be held at 6 different stages around the city. It is expected to have over 50 performing artists to participate in the showcase along with internationally renowned music artists, record companies, labels, festival curators and media. Beside showcase events, 8 professional music forums consisting of “International touring” and “Asian music market” will be organized during the festival. LUCfest Music Festival is designed to bring forward different markets and music style. We are dedicated to provide a complete and diverse combination of Asian music, artistic creativity and aesthetics. Not only we lead the audience to explore deeply the rich energy of Taiwan's independent music, but establishes a platform for information and resource exchange between Asian and Western music industry promoting and matching Taiwan’s artists to the international stages. Tickets are refundable with 10% return handing fee up until 10 days before the event, which means tickets must be RECEIVED by KKTIX on and before 2018/11/19. Tickets RECEIVED on and after 2018/11/20 for refund will NOT be accepted. For KKTIX address, please refer to KKTIX REFUND POLICY. NOTE: If you choose Family Mart as ticket collect method, you will still need to pick up your ticket at Family Mart and send it to KKTIX.